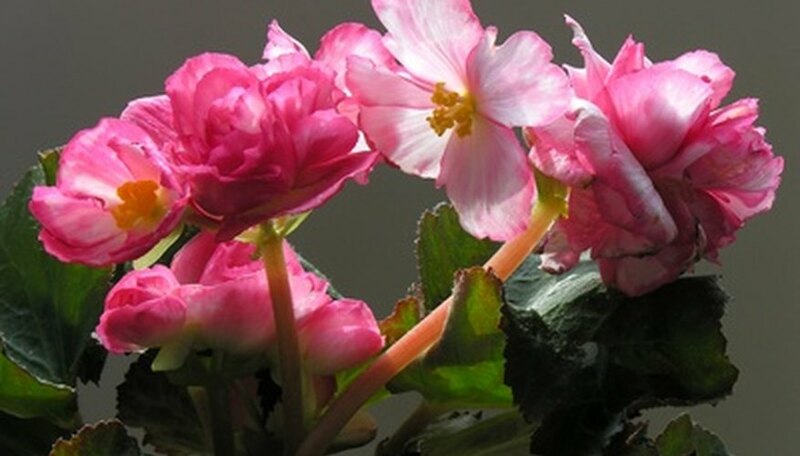 Common types of begonias are tuberous and semperflorens. The semperflorens include wax begonias and everblooming begonias. This is a compact, dense plant that produces flowers in pink, red. white and yellow single or double blooms. Begonias grow best in partial to total shade depending on the variety. They are commonly used as patio, mass bed plantings or hanging basket plants. The plants are not frost tolerant and must have special care throughout the winter. Gradually reduce watering intervals and stop fertilizing the plants at the end of August. If your plant buds in September, pinch the buds off. Allow the foliage to yellow until it is completely dead or until the first frost. Dig the tubers out of the soil and cut the stems to 5 or 6-inches. Set the tubers indoors at 65 to 75 degrees F., out of direct sunlight until the rest of the stems and roots are dry enough to pull off. Clean off any stems, leaves, dirt or roots without putting them in water. Place the tubers in a plastic bag and poke a few holes in it with a sharp knife. Store the tubers in an area where the temperature will stay between 40 and 50 degrees F. Check on the tubers once a month, and remove any that have started to rot or are getting soft. Plant outside in the spring when all threat of frost is gone. Bring the plants indoors before the first frost. Replant them by removing them from their containers and replacing the soil with a fresh, rich potting soil. Place the pot in a sunny window for one week, and water when the soil feels dry at the top. Gradually reduce the light to acclimate the plant for indoor, winter conditions. Water once a week, and expect leaf drop for the first two or three weeks. Clean debris from the container until the leaves stop dropping. The plant should acclimate and start to grow again in about two weeks. Gradually place it back outdoors in the spring when the last threat of frost is over.